Need guidance on life issues or challenges? Sometimes you can be too close to an issue or problem to see clearly what is at the root cause of it. It is only when you know the root cause that you can address it appropriately. Spiritual Spectra offers Spiritual Consultations which convey messages that bring clarity to current issues or challenges and/or closure to unresolved issues. Our Spiritual Consultations empower individuals by providing insight and guidance on life transitions and challenges, relationships, careers and more. We treat all sensitive subjects with care and provide an empathetic, non-judgmental, supportive and relaxing environment. 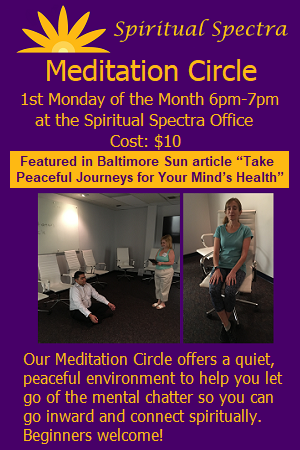 We offer Spiritual Consultations in our Maryland office as well as over the phone or online. Read further down for cost and description. Please visit our Frequently Asked Questions page prior to scheduling your appointment for answers to method of payment, and more. Contact us to schedule a consultation. Please indicate if the appointment will be at our office, via phone or online. The fundamental difference between a Spiritual Spectra Spiritual Consultation and a Tarot Card Reading or Psychic Reading from another practitioner is that a reading is just that a reading of the cards or psychic message and nothing more. Whereas during a Spiritual Spectra Spiritual Consultation, after the Tarot Cards have been read we do an overview of all of the cards, consult with the client as to a direction to take in their life, help them develop a plan of action and/or provide advice as to how to handle a situation and in some cases refer them to resources. The Tarot Cards can often reveal situations that are challenging and overwhelming so we believe it is our responsibility to not just read the cards but to advise and provide support to our clients. Having provided over 500 consultations, we have the experience to help you. Choose the Spiritual Consultation that is right for you. Clients can choose to pay in advance by clicking the above link or on the day of the appointment. Please visit our Frequently Asked Questions page prior to scheduling your appointment for answers to method of payment, and more. Contact us to schedule your appointment. Please indicate if the appointment will be at our office, via phone or online. Spiritual Consultations can also be offered for groups and events, click here for more information and pricing; and at Metaphysical/New Age/Psychic fairs and festivals. Click here for our Calendar. Times and cost at fairs and festivals may vary. Being centrally located, our Spiritual Consultations serve the following communities: Columbia, Ellicott City, Elkridge, Catonsville, Jessup, Fort Meade, Laurel, Fulton, Silver Spring, Clarksville, Highland and Olney, Maryland. However, we offer consultations over the phone and online so we can serve you no matter where you live. Contact us to schedule an appointment today!